NASHVILLE, TENN. (May 26, 2017) – Rhonda Vincent, who The Wall Street Journal dubbed “The New Queen of Bluegrass,” is teaming up with country sensation Daryle Singletary for the upcoming duets album, American Grandstand, set for release July 7. The project delivers real traditional country music with a unique American twist. This must-have album will be released via Upper Management Music, and fans can pre-order American Grandstand HERE. The lead single, “One,” offers the very first taste of American Grandstand. The slow love song takes fans on a musical journey. The track may sound familiar, as it was previously made famous by country legends George Jones and Tammy Wynette, whose demanding vocal duets helped propel both acts to superstardom. Singletary and Vincent first performed “One” together at the legendary Grand Ole Opry at the Ryman Auditorium in April of 2016. Due to the overwhelming response, the dynamic pair chose to add the track to American Grandstand. Standout songs include the title track, which was written by Vincent. 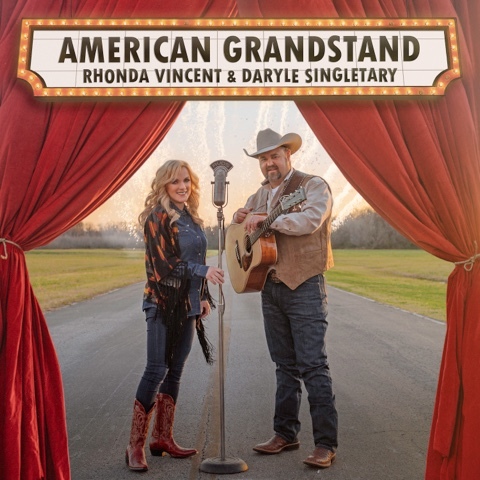 When Vincent and Singletary were first trying to think of a title, American Grandstand stood out, which by definition is “to behave or speak in a way that is intended to impress people and to gain public approval.” This isn’t Vincent’s first venture into country music, as her previous Grammy-nominated studio album Only Me featured a combination of six traditional country songs and six bluegrass tracks, featuring “We Must Have Been Out of Our Minds,” which is also included on American Grandstand. Fans will have the chance to experience both Singletary and Vincent together as they play select shows later this year (full schedule HERE). Fans in the Nashville area will get multiple opportunities to experience traditional music at its finest, as the pair will appear on the hit show, “Music City Roots," along with an appearance at CMA Music Festival, plus a must-see album release party at The Nashville Palace.